"A whole-house fan is a fixture that is often located in the ceiling of a home. In rare occasions, they can be located in a wall." Attic fans only cool the attic - AVOID solar attic fans! 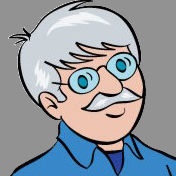 DEAR TIM: What's the difference between a whole-house fan and an attic fan? Which is the best one to have in a home? DEAR RENEE: Whole-house fans and attic fans are as different as apples and watermelons. What's the Difference Between a Whole House and Attic Fan? Both fans move air just as apples and watermelons are both fruit, but the similarities end there. A whole-house fan is a fixture that is often located in the ceiling of a home. In rare occasions, they can be located in a wall. Where are Whole House Fans Located? A whole house fan might be in a hallway or some other central location of the home. The fan is always located on the highest ceiling or wall and oriented so that it blows air directly into an attic space. This is a typical whole house fan. It can be set horizontally as you see here or vertically in a side wall. CLICK THE PHOTO NOW TO SEE ALL THE DIFFERENT TYPES YOU CAN HAVE DELIVERED TO YOUR HOME IN DAYS. The whole-house fans cool you because they pull air through open windows and doors in your home. The breeze in a house can be significant depending on how many windows you open and where they are in relationship to the fan. CLICK HERE to get FREE & FAST BIDS from local fan contractors. They can install BOTH fans in your home. Does a Whole House Fan Move Lots Of Air? A typical whole-house fan moves vast amounts of air. The blades of the fan can be large, and they can have significant pitch so they can move thousands of cubic feet of air per minute. Turn one of these bad boys on inside an average-sized ranch home that has 2,400 square feet of finished floor space, and you can replace every bit of stale, hot inside air with cooler outside air in less than five minutes. Do They Push Air Through an Attic? These fans are designed to pull air through a house and exhaust the air by pushing it through an attic space. Since you live in an area that has low humidity, they are superb and highly efficient cooling devices. They work best when they are operated in the early evening or night hours as outdoor temperatures start to nosedive and the inside air temperature of a house is still high. As outdoor humidity rises, the cooling effect from whole-house fans drops. An attic fan is completely different. These are smaller fans designed to move hundreds of cubic feet of air per minute out of your attic area only. 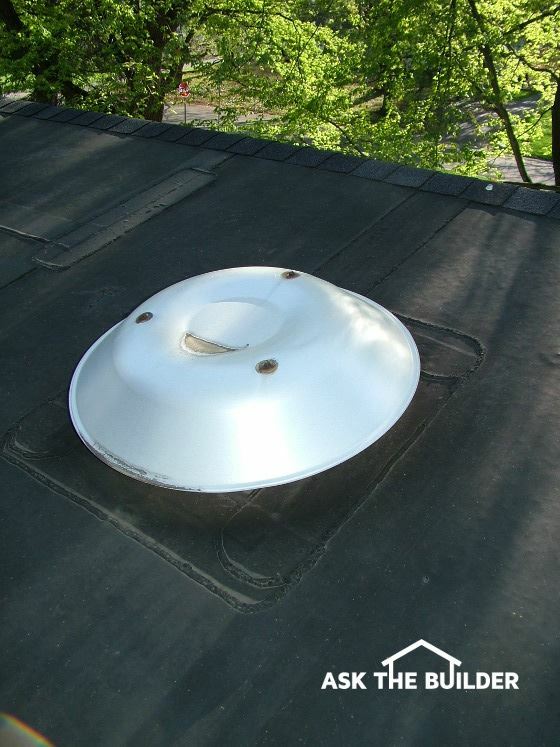 These are mounted to the surface of your roof in most cases looking like a small space ship has landed on your home. 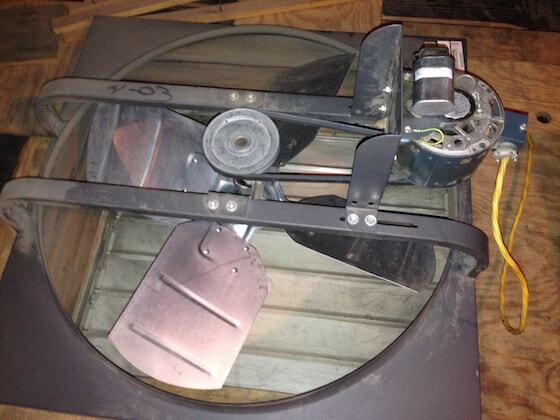 This is a typical attic fan. It just mounts up on your roof. You need to run 120-volt electric to it to power it. Do NOT get the solar-powered fans. They're WORTHLESS as they don't move air when you really need it late in the day. 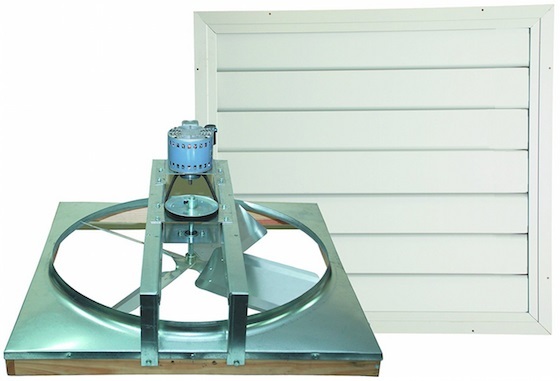 CLICK THE PHOTO NOW TO SEE ALL THE DIFFERENT TYPES OF ATTIC FANS SO YOU CAN HAVE ONE OR TWO DELIVERED TO YOUR HOME IN DAYS. In some cases, the fans can be mounted INSIDE your attic on a vertical gable wall. You then see a louvered vent in your gable wall. Do Attic Fans Move Air Through a House? No, these fans are not supposed to move air through your home. They only move air through an attic space above where you are. The cooling principle here is simple: If you replace the extreme hot air inside an attic that might be 140-160F with air that is 85-95F, the inside of your home should also be cooler. How Long Does it Take To Cool the Attic? The issue is it can take many many hours before the attic lumber and insulation cools enough that you might feel a difference down inside your home. The heat gain from extremely hot ceilings adjacent to hot attics can stress air-conditioning systems, and push them to the limits of their ability to cool a home. Where do the Fans Exhaust the Air? For both fans to work properly, they need to easily exhaust the air to the outdoors. The attic fans do this by default, as you typically have to cut an opening in the roof or a side wall of an attic to mount the fan. 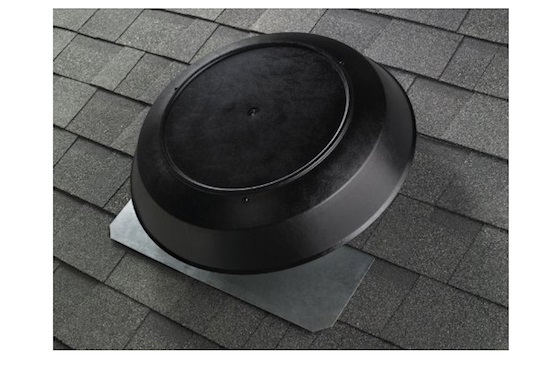 When installing a whole-house fan, you need to install several static pot vents in the roof that allow air to get out. You can also install very large gable vents if your home design permits this. The whole-house fans come with instructions that tell you how much NET FREE SPACE of ventilation you need so the fan works properly. Do the Fans Need Lots of Intake Air? The attic fans also need lots of intake air vents along the lower edges of the roof. Continuous soffit venting is the best and the air from the outdoors needs to be able to easily enter the lower reaches of the attic where the roof passes over the outside walls of the house. Since most attic fans are located high up on a roof, this design allows for excellent cross ventilation of the entire attic space. Can Attic Fans Can Rob Air From Home? If you don't provide enough intake air vents for attic fans, they can draw air from inside your home. This happens because the moving blades of the fan create a partial vacuum. It's not a good idea to send cool air from the inside of your home up into an attic, since you are paying good money to cool inside air with an air conditioner. Do Whole House Fans Need Lots of Vent Space? Whole-house fans also need plenty of exhaust air vents through the roof or through side gable walls of attics. Each whole-house fan manufacturer tells you for each size fan how much net-free area of exhaust ventilation the fan requires to work properly. If you don't provide this exhaust ventilation area, the fan blades will spin, but not move the maximum amount of air. Do Both Fans Remove Hot Attic Air? Whole-house fans serve double duty as they remove hot air from the attic as they work. But you do not necessarily want the whole-house fan operating in the middle of the day as your attic heats up. IMPORTANT TIP: For this reason, it makes sense to have both types of fans in a house. They operate at different times of day and night, since they are designed for two different purposes. Whole-house fans work so well, they are often equipped with timers. If you operate one all night long, you might need to sleep with blankets. They often can cool a house to a comfortable temperature in just several hours. What Windows Should Be Open With a Whole House Fan? You can get concentrated cooling with a whole-house fan by opening the windows in selected rooms. As the fan operates, it creates a comfortable breeze in the rooms with open windows. Should You Close Fireplace Dampers? Be sure you do open windows before you turn on a whole-house fan. If you don't and you have a fireplace with ashes in it, you will create an ash storm as air is sucked down the chimney and rushes across the dry fireplace ashes. The dirty ashes are then broadcast through the house as they are sucked towards the whole-house fan. How do I know this? It's the voice of experience talking. Whole house fans move air through a house and up and out the attic. Attic fans just move air through attics. We just bought a home in New Brunswick Canada and we are trying to find out what the Aston Atic 2000 Box is on the wall. It looks like a thermostat but says humidity percentages. We are very humid out here and have a dehumidifier going in the finished basement and would like to know if this unit is a humidifier or dehumidifier. Bob, you need to schedule a 15-Minute call with me. There's simply too much to talk about and type. We have a 1 1/2 story house. Half the house has vaulted ceilings, the other half is a two story house. The downstairs has a separate a/c unit from the upstairs. I'd like to install a whole house fan upstairs. Only one upstairs room is used as a bedroom. I have two concerns: First, is the noise a whole house fan makes uncomfortable for sleeping? Second, Is there any reason I can't install it in the ceiling of the adjacent upstairs room? If I did this, would it detract from the cooling of the bedroom, which would defeat the purpose? Charles, your question requires lots of typing, plus I have some questions for you so I can give you the correct answer(s). I only do pithy answers here in the comment section. If you want to protect the investment you have in your house and not waste time or money *hoping* you make the right decision, you should talk to me on the phone for just 15 minutes. It'll be the best investment you've ever made in your home! I would like to install a whole house exhaust fan to remove the hot summer air from my upstairs, that has cathedral ceilings. Unfortunately, my roof has extremely negligible attic space above the cathedral ceilings. Can I just exhaust the whole house fan air to the outside through a fan panel cut very high on the wall, instead of venting through the attic ? hi ; would you be able to get &/or give me info for a system that is installed in our home. When we moved in we did not get any info on this system. The system in question is a ASTON ATTIC 2000 RELATIVE HUMIDITY. We have tried to locate company, looked it up on web. With no results.Had no luck at all finding anything on this system. If possible please help.. thank you for your time.. There's a great tool for this. It's called Bing.com. Try it! I have an attic fan blowing air out the gable end. And the other gable is open, and I have a ridge vent, but I seriously question the air flow through it. Both gable ends are heavily screened and louvered, so air flow is somewhat restricted. I wanted to install a fan at the other gable end blowing cool air INTO the attic. Are attic fans designed to be installed in this manner? If not all, are any so designed? Hello - I just purchased a home with a huge fan in the attic wall - the house is a split level. My last 2 homes had small gable fans in the attic which were temperature controlled. i have not had a home with this type attic fan - this one is time controlled but will be switched to a temperature control. When I turned on the existing fan with the attic door open it pulled air from the farthest recesses of the house. Question - do I need a gable fan too? to clear the attic or just use what is there with a temperature sensor. No need for a gable fan. Just be sure you have enough NET FREE SPACE so the giant house fan can easily PUSH OUT all the hot air from the attic. Thank you - I believe I received an email from you but can't find it again - what address would it have come in from. Several years ago I realized we had two attic fans powered by 115 volts, next to each roof-top air conditioner. Attic temperature averaged 30 to 50 degrees higher than outside temperature. Here in Arizona, that was a hot. I removed them, closed up the roof, and installed a gable attic fan powered by a 35 watt solar panel. I also installed vents on all the soffits to let air into the attic. Since then the attic air temperature has been around 10 degrees hotter than the outdoor temperature, and made a difference in our electric consumption.